An adventure game starring Taco the dog. MORE power can't be WORSE, right? "Reality is limited. If you trust it blindly, you're doomed." Pong, with a magical twist. "My plan won't fail. The pieces are on the board, and I'm ready to win!" An online multiplayer game of exploration, sarcasm and geocaching. Juego de plataformas con deidades de los cuatro rincones de la tierra. Right now, when you open a page with an embedded HTML5 game that has the "Automatically start on page load" option disabled (i.e. a game that requires a click to play), the "click to play" screen shows at the size of the embedded game. In contrast, if you open a page of an HTML5 game that runs in fullscreen ("Click to launch in fullscreen"), the "click to play" screen shows at a small size. My suggestion: allow creators to use the small size for the "click to play" screen, even for not-fullscreen games. The canvas would then resize to the correct size when the game is run. The reason for this suggestion is that sometimes, the embed is simply too big. I always fear that someone may actually think that there's nothing else in the page other than the playable game. With a smaller embed, it's obvious that there's information under the game area. IO Game Jam (Over $500 in Prizes) community · Created a new topic Ideas for backends? Does anyone have any ideas or tips on how to create the backend for the games? Any useful framework, hosting service...? Thanks! Characters auto-attack when they are not moving. The cleric doesn't attack, but heals itself or the others. Oh, too bad. With that in mind, my opinion is to group them, then. I believe that Google drives the most traffic for most people, so keeping Yandex with that level of detail won't be that effective (specially since a lot of people won't even understand the search terms). Of course, the ideal scenario would be to have some way to group or separate the links with a button or something, but that's probably too much work. @leafo That would be useful, indeed. The downside is that we would lose the search keywords. I don't find them very useful right now because I don't understand them (so, in my specific case, I agree with grouping these links), but some people may be able to read them. How's Google being handled? Note: I thought I had published this before, but it seems that I didn't save it. Sorry if it gets posted twice. 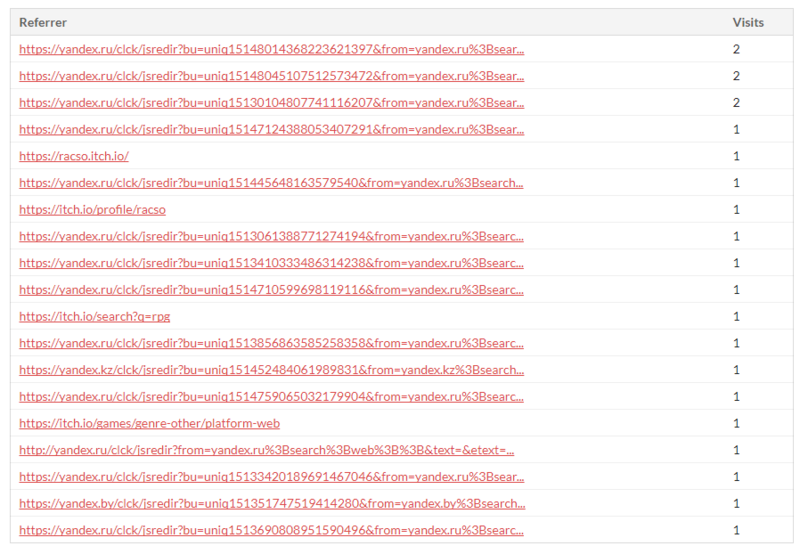 Perhaps Itch.io could simply ignore the links that come from those domains? Thanks for the answer! I'll probably start on time anyway, as I haven't been able to work in the project yet (sigh). I've just played the game and got the 3.5 endings :) Nice story! The "text written with the stone" thing was a cool plot-twist! Are you talking about this entry? https://itch.io/jam/minimalistic-jam-2/rate/208922 I played it and it wasn't a virus. I got, however, the standard Windows warning about unknown publishers. Truth is, the "Chapter 1" thing was just a way to set the game mood a bit more, especially given that it ends with a cliffhanger. However, some people have told me that they would like to know more about the story, so I may, in fact, continue the series at some point. The simplicity in those details you mention were because of time. Sadly, I could only work in the game during the last week of the IGMC, so I had to cut as many corners as I could and prioritize the vital aspects of the game. The thing is, the MCT jam hasn't started yet. My question is: will this jam require games to be fully developed during the jam period, or would it be OK if I have an early start? Same error here. Also, images aren't loading properly in the website. It seems to me that some SSL certificate expired for Itch and things are breaking because of that. I already had reviewed yours. Good luck! The graphics are way too similar between different units. During combats, I struggled to understand which ones were my units and which were enemies. You may quickly fix this with more colors. In fact, I would suggest you to use 2D instead of 3D; it's easier, and I don't really think you need the 3D. There's no tutorial or explanation. I read your commands, which helped a lot, but the game probably needs more instructions. This is personal taste: there's a lot of randomness. My knights miss a lot. I prefer games that aren't quite based on luck. For example, I like The Battle of Wesnoth, but I wish it didn't have the randomness element it has. All in all, this is a quite impressive effort. I hope you continue working on it for a bit! Good luck! Good effort, and yes, the stick figures were used quite a bit in Flash videos and games some years ago! Good audio, too! Did you make it? The game seems to be difficult, but it's actually quite playable once you know the behavior of your enemies. Hi. The app is asking me for login. I've recently found that non QWERTY keyboards are more common than I thought. It's obvious that, indeed, I must somehow support key mapping. For now, I hope that you could at least play a bit easier with the fire wizards (which use the arrows for movement). @Metallic Fist Digital Limited Done, played and reviewed your game! Hi everybody! Here's my entry: https://racso.itch.io/power-word-pong - I'll be playing and rating your entries. If someone plays mine, please reply to this post with your game so I can check it out, too! This is insanely funny haha. The consequences of both a correct and an incorrect pizza are hilarious! Well done. The graphics look quite good! Hi everybody! In case you are curious, I published a post-mortem explaining my development process of Power Word: Pong. You can read it here. I hope you have fun playing the game! As always, your feedback is more than welcome! No, there's no protection. I've been thinking about that since the beginning and have some ideas, but nothing implemented yet. What I do right now is to put some more caches myself. And yes, confirmation would be nice. Or requiring those actions to click a button instead. Thanks! By the way: Solmir (just below) took every geocache in the game and hid them quite away from the starting point. Because of that, you may have lost the gameplay of searching and finding caches. It's obvious that I need to think how to deal with this kind of scenarios, but, for now, I've left some extra caches in the world, just in case anyone (or you, again) takes a look now. I don't know what to say about "Up" as a jump button. Before, I had set Space as the jump button, but changed it based on another comment. Each person has its own taste, I guess. Anyway, you can change the controls when you run the game in Windows. Woa, you really did an incredible job finding everyone's caches! I'm happy you enjoyed the game this much! Apart from the floor issue, you've left me with some improvements to do. First, I need to implement a "Max score" system to record each player's best score, as he may lose it if another player steals his caches. Surely, the score that counts is the current one (which goes up and down), but having a souvenir of the best score a person ever had would be nice. Another thing I need to define is how to deal with every cache being too far (like they are right now), as new players won't be able to find anything at all unless they put a lot of effort into it. About the compass: yeah, that's difficult to handle, specially with screens being so different. I have some ideas for improving the UI (and also for the compass itself) that I may implement in the future. Thanks a lot for playing and for the feedback! What do you think is backward? Sorry about that! I appreciate you taking the time to review the game, even if in the end you don't like it. Btw, your comment seems to be duplicated. Hi! About finding the caches: it's not impossible because I put a compass! You probably missed it as it is new. When you press Esc to see the information, in the upper right corner there's a compass that shows you the amount of caches in every direction and the distance to the closest one. That means that the players always have an idea of where to find, but they don't know how the path to the caches is (for example, you can hide a cache in an isolated spot that requires you to arrive from the top, so players trying to arrive in a straight line won't be able to reach it). I played the game without knowing it's actually random; the signal got to 5 close to the cat, without having anything in my hand. Confused, I came here and read Naomi's comment and your answer. I'm not sure on what to think about the game being fully random. On one side, is the ultimate trolling, and it's truly faithful to the comic. On the other side, it's kind of disappointing as you think that you may use your wits to triangulate the ideal position only to find that it doesn't actually exist. I've created a jam pos-mortem. If you're curious, you can read it here: https://racso.itch.io/skateboard/devlog/16038/jam-post-mortem. By the way: congratulations to everybody for finishing the jam! xkcd Game Jam community · Posted in Our entry (xkcd vr) got featured in the press! Hell yeah, I'm a star! If I understand correctly, you also made the graphics and the music. Well, congratulations on that! I agree with Cosmologicon in that the game isn't challenging. I've never played Katamari, so I don't really know how do they handle challenge on it. Perhaps with a timer, so you have to plan a route to absorb everything as fast as possible? Hi again! I've updated the game, and now it's actually playable. If you have some time, I'd appreciate your feedback on this version. Oh, and I had to reset the database, but I preserved the old characters of two people, including you :) I moved it way above the surface, though. Cheers!